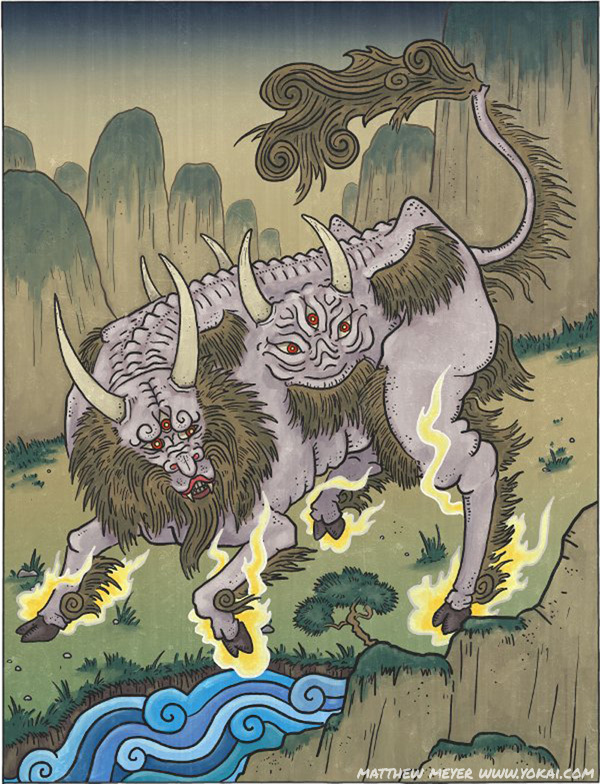 APPEARANCE: The hakutaku is a wise chimerical beasts that resembles a white ox. It has nine eyes — three on its head, and three on each of its broad sides — and six horns. Hakutaku live in remote mountains, and only appear in eras and countries where the ruler of the land is a wise and virtuous leader. They are extremely good omens and symbols of good luck. Hakutaku can speak human languages, and are highly knowledgeable about all things in creation. INTERACTIONS: Because of its incredible knowledge of the various kinds of yokai and monsters, paintings of the hakutaku were very popular in Japan during the Edo period. They were sold and used as good luck charms and as wards against evil spirits, disease, and other yokai. Because the hakutaku knows all, it was believed that evil yokai would stay away from him. 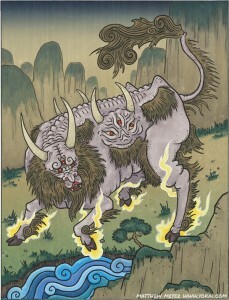 ORIGIN: The hakutaku, like many other holy beasts, comes from Chinese legends. In China, it is known as the bai ze. LEGENDS: One of the most famous accounts of a hakutaku comes from the legendary Yellow Emperor (2697–2597 BCE) of China. The emperor was performing an imperial tour of his lands, and in the east near the sea, he climbed a mountain and encountered a hakutaku. The two spoke, and the hakutaku told the emperor that in all of creation there were 11,520 different kinds of yokai. The emperor had his subordinates record everything the hakutaku said, and it was preserved in a volume known as the Hakutaku-zu. 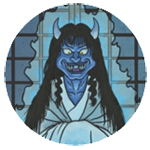 This volume recorded each kind of yokai, along with what kind of evils they do, or disasters they bring, as well as how to deal with them — a sort of demonic disaster manual. Unfortunately the Hakutaku-zu was lost long, long ago, and no surviving copies exist. A legend from Toyama prefecture tells of a Japanese sighting of a hakutaku. It appeared on Mount Tateyama, one of the tallest and holiest mountains in Japan. This creature, called a kutabe in this legend, warned of a deadly plague that would soon sweep through the lands. It told the villagers how to create magical talismans that would protect them from the plague, and they were saved. Since then, the hakutaku has been revered as a symbol of medicine.